ATOMIC NOIR IS IN THE BAG! 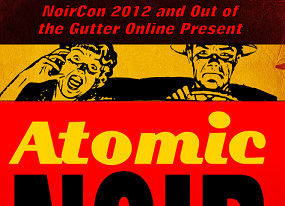 Many, many thanks to everyone who participated in the Atomic Noir Short Fiction Contest! Duane Swierczynski and Lou Boxer were overwhelmed by the deluge of astonishingly good stories that captured the mood and style of post-World War II crime fiction, and deciding among them was often a painful process. But it had to be narrowed to four, and we are ready to announce our winners. I would advise you to hang onto your fedoras, but that headgear was largely out of style in the era we're focusing on, so maybe I will just say crawl under your desk, get into a fetal position, and wait for the nuclear blast to obliterate the world as you know it...but, somehow, that doesn't sound right either. Congrats to these four dynamite writers. The volume is dropping, like, out of the sky, with imminent impact that will leave the world a nightmarish, glowing wasteland, November 1, in print and Kindle editions.